The Pectoral Sandpiper is a medium-sized shorebird that breeds across the wet tundra of both North America and Siberia, and winters in the grasslands of southern South America. During migration it is found more commonly on mudflats with short vegetation than in the water. Its contrasting streaked breast is distinctive, and the Pectoral Sandpiper is sometimes described as a larger version of a Least Sandpiper because if this characteristic and its yellowish legs. The Pectoral Sandpiper is a common migrant in Tennessee, and frequently occurs in large numbers. In spring it is most likely found from early March to mid-May, and in fall from mid-July to late October, however there are records in Tennessee for every month but February. Description: This medium-sized sandpiper, has a moderately long neck, a moderately long, slightly decurved bill, and moderately long, yellowish or greenish legs. It is reddish-brown above, and white below with a dark densely streaked breast that has a relatively abrupt lower boarder. Immature birds (July-November) are similar to adults, but have a more scaly pattern on the back, and have finer streaks on the chest. Males average 50 percent heavier and have wings 10 percent longer than females. Voice: Call a distinctive, raspy, harsh drrup or jrrff. Baird's Sandpiper is smaller, with less distinct chest band, and dark legs. Least Sandpiper is similarly marked, but half the size. 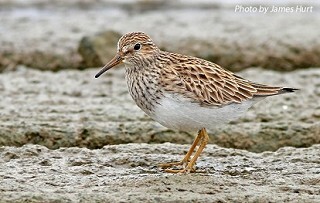 Habitat: In Tennessee, Pectoral Sandpipers use exposed mudflats, plowed agricultural fields, the edges of lakes and ponds. Diet: Primarily arthropods and other invertebrates. Nesting and reproduction: Pectoral Sandpipers have never been known to nest in Tennessee. Status in Tennessee: The Pectoral Sandpiper is a common migrant and rare winter visitor, most likely found across the state from early March to mid-May, and from mid-July to late October. There are records for this species in Tennessee, however in every month but February. Individuals at the extremes of the range in the Arctic and the pampas of southern South American, have a potential 19,000-mile annual round-trip migration! 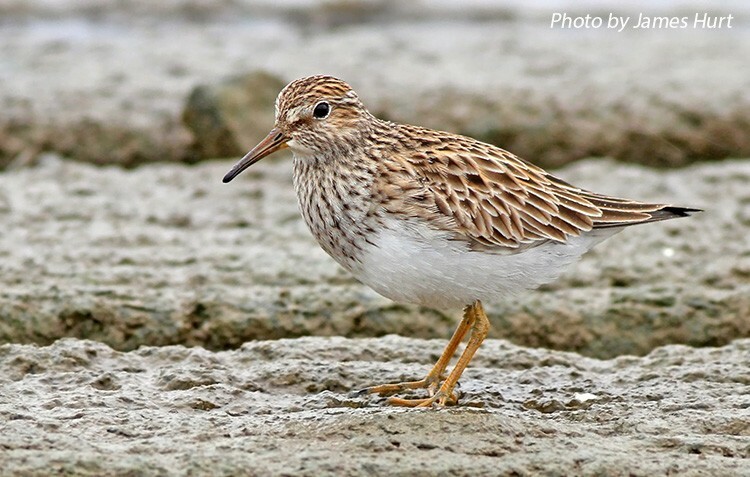 Global warming may be affecting the timing of migration for the Pectoral Sandpiper. In Ohio, birds are arriving a month earlier in the spring and returning several weeks later in the fall. Holmes, R. T., and F. A. Pitelka. 1998. Pectoral Sandpiper (Calidris melanotos). The Birds of North America No. 348. (A. Poole and F. Gill, eds.). The Academy of Natural Sciences, Philadelphia, PA, and The American Ornithologists' Union, Washington, D.C.